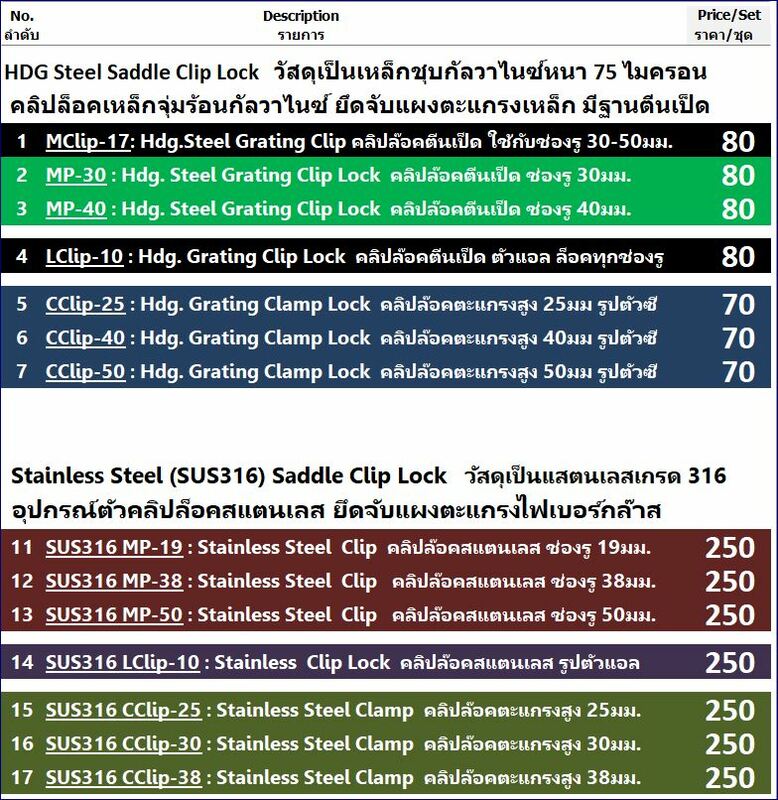 ตัวคลิปล็อคยึดแผ่นตะแกรง มี 2 ประเภทวัสดุ ทั้งแบบ Stainless Steel SUS316 และแบบ Hot Dip Galvanized Steel เนื่องจากถูกออกแบบมาให้ใช้พื้นที่ต่างกัน โดยส่วนมากแล้วคลิปล็อกแสตนเลสใช้สำหรับยึดแผ่นตะแกรงไฟเบอร์กล๊าสหรือแผ่นงานแสตนเลส ส่วนตัวล็อคที่ทำจากเหล็กชุบซิงค์ออกแบบมาให้สำหรับยึดแผ่นตะแกรงเหล็กเข้ากับฐานรองด้านล่าง โดยสามารถปรับระดับแนวการยึดได้ ทั้งสองแบบใช้งานคล้ายๆกัน โดยลูกค้าสามารถเลือกแต่ละแบบให้เข้ากับช่องรูของตะแกรง (Mesh Size) และพื้นที่ที่ต้องการนำแผ่นตะแกรงไปติดตั้ง These clips can be used to fasten steel grating to structural member. To install, use welded stud which may be welded through grating in place. GRATE-LOCK Grating is an easy-to-install system of interlocking planks, treads and accessories, providing safe, sturdy footing for mezzanine floors, billboards, highway signs, rooftop walkways and other applications. Increased load performance has been achieved through interlocking planks and a “ventilated” rung design. Hundreds of sole-gripping dimples ensure a safe surface in all kinds of environments. 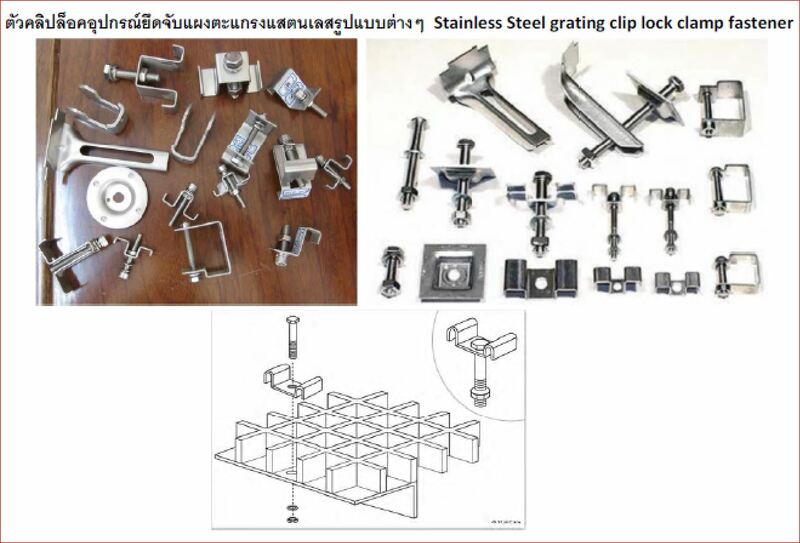 GRATE-LOCK can also be ordered without textures, making a product uniquely suited for rack decks, clean rooms and ceilings. 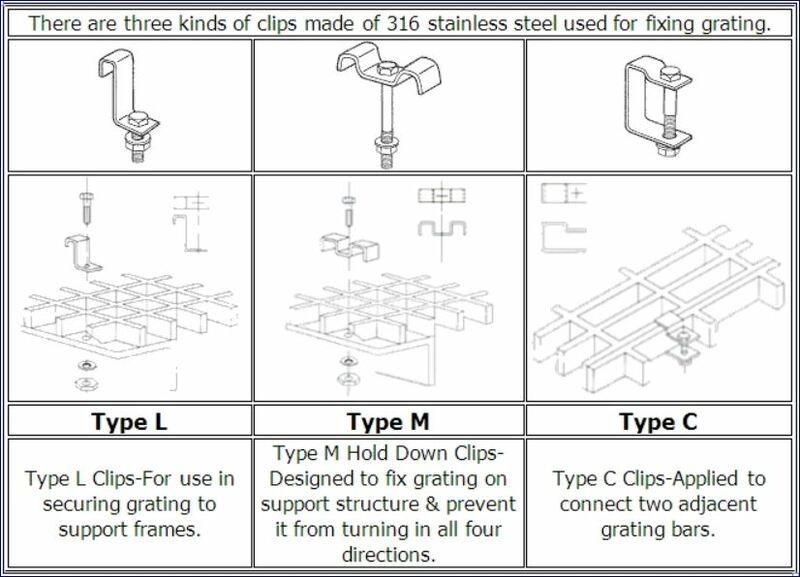 SADDLE CLIPS are used to anchor welded steel, pressure-locked aluminum, or steel grating. They are ideal for installations where grating is frequently removed. All bar grating must be tightly fastened in place. Welding of the grating panels to the supporting embers provides a superior, permanent installation. 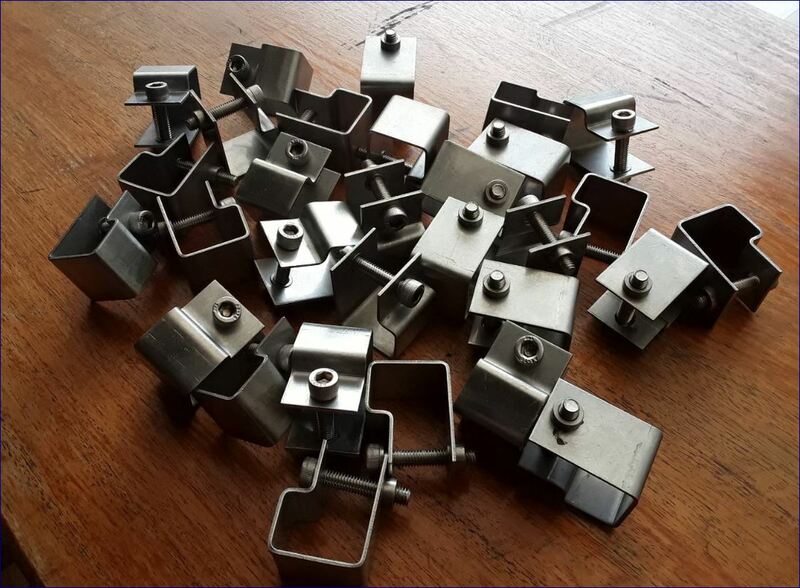 Although, for gratings that are subject to removal, they can be fastened with plate fasteners which are shop welded between the bearing bars and fastened with stud or bolt an alternative is also using the standard type Saddle Clip. 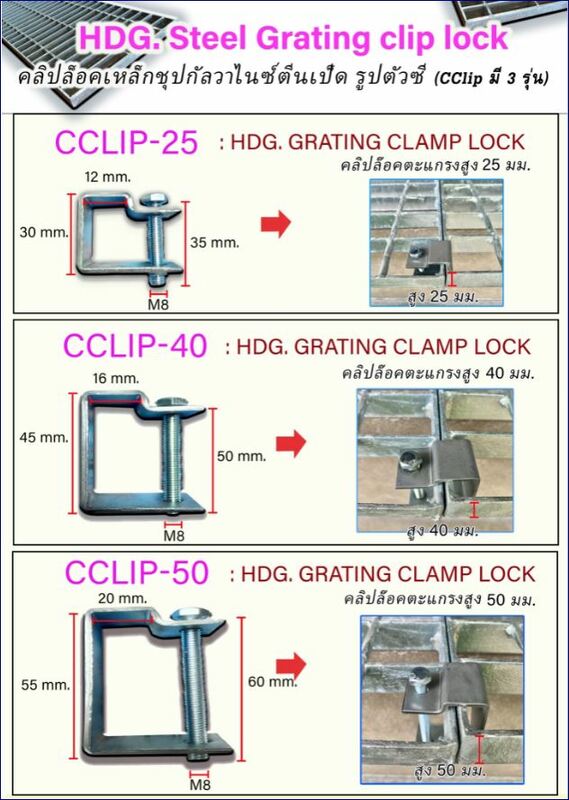 In areas where welding or drilling is not permitted, Grating Clamps can provide the fastening solution. These bar grating anchoring clips install on the top surface of the grating and create a friction connection with the flange supporting the panel. The narrow spacing of close mesh aluminum gratings allows for countersinking of the bearing bars and fastening with flat head screws. 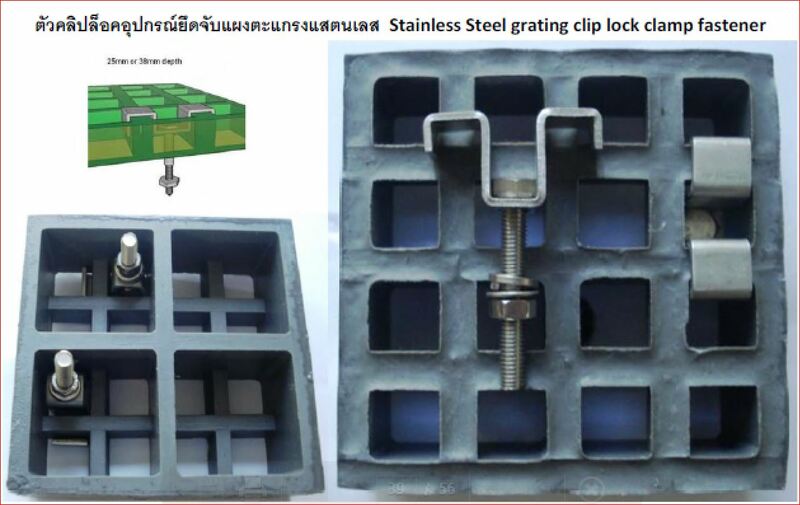 The Grating Clip grating fastener is a cost effective method of securing steel grating to existing structural steel members. The use of grating fasteners eliminates costly and time consuming welding and drilling. No access below the grating is required, resulting in a quick and simple installation. 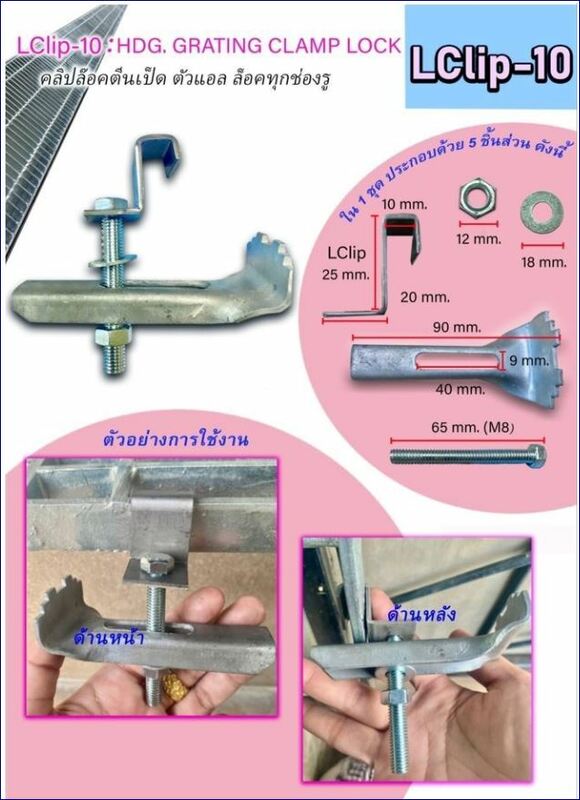 The Grating Clip grating fastener can be installed with a screwdriver and can be easily removed allowing the grating to be re-positioned or removed for maintenance purposes. 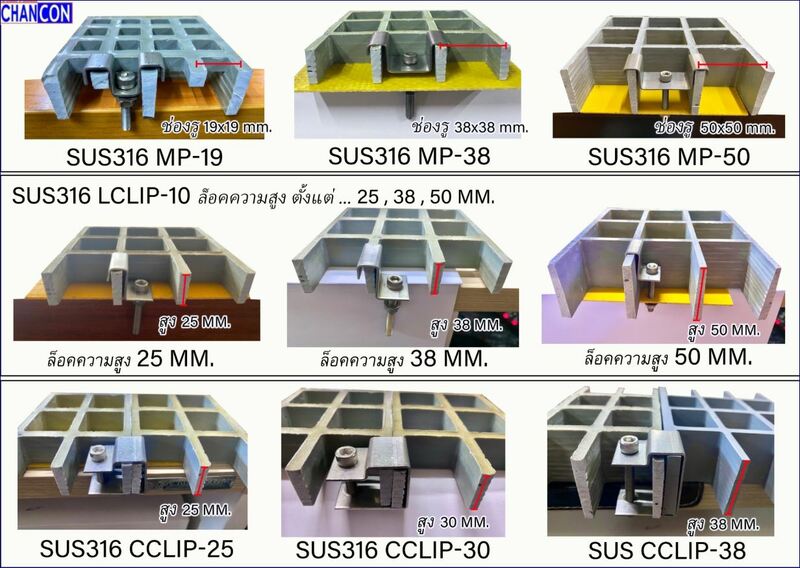 The Grating Clip grating fastener will suit grating bar widths and grating bar dept to ensure that most standard grating sections can be accommodated. 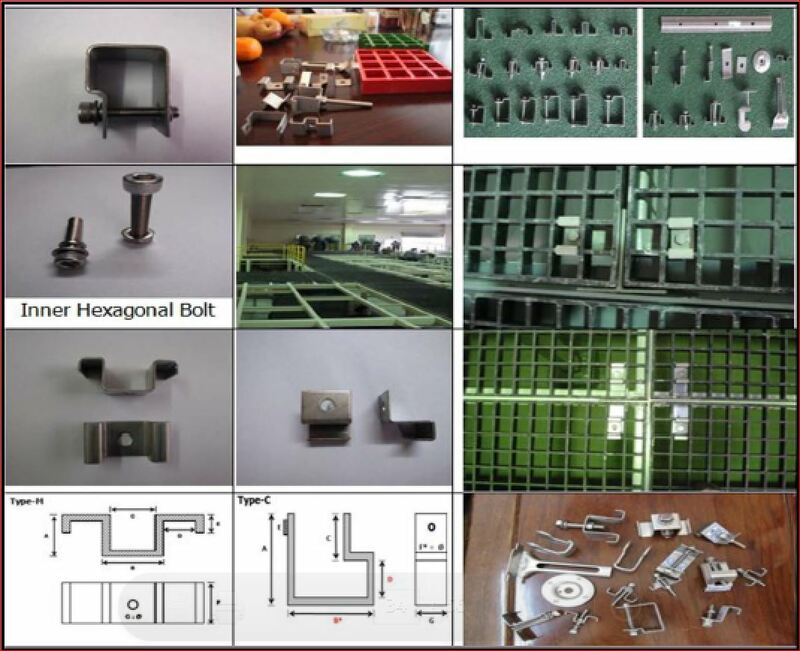 Chancon manufacture supplies the Anchoring Devices attach Saddle Fixing Clip Lock Clamp Lock Fastenal Fastener Bar Steel Grating in Mild Steel, Hot Dip Galvanized Finish, Stainless Steel (316 Grade) – Suitable for Fixing Grating Panels. 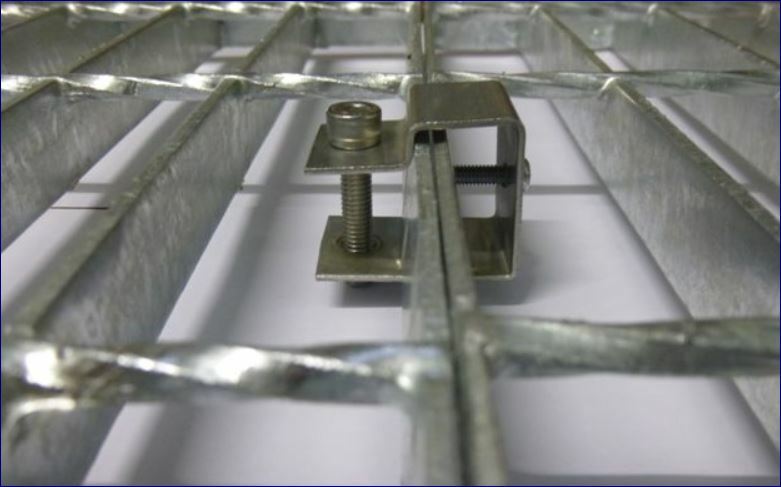 Grating Clamps are simple fasteners that allow bar grating to be attached to steel structures without the need for drilling or welding. 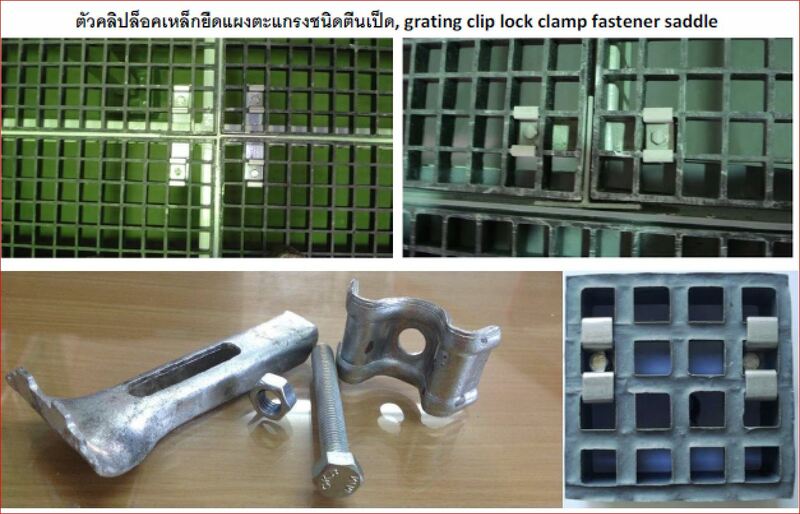 There are many advantages to using grating fasteners. Grating fasteners are safer because they don’t require dangerous welding or drilling. This is also perfect for industrial environments where drilling and welding is not allowed. Grating clip Saddle Fastenal fasteners are also very easy to install, unlike traditional bar grating attachment welding, the grating Clamps can be removed and re-fixed to allow access to areas below the grating.